Toyota launched its 4th generation Prius at the Frankfurt Motor Show today, but, strangely, held back details of CO2 and performance. 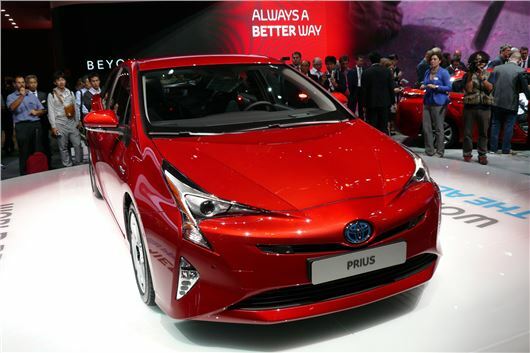 The new Prius, on Toyota's New Global Architecture platform is 4,540mm long x 1,760mm wide x 1,470mm high and sits on a 2,700mm wheelbase. It has a lower centre of gravity than the previous Prius, double wishbone rear suspension and is 60% more rigid, improving handling. The press release tells us its new Prius "heralds the next generation of Toyota's signature hybrid powertrain" but is strangely reticent about the details. It talks of making its next generation hybrids easier and more intuitive to drive, that fuel economy is improved and that the new drivetrain is more compact. We get two statistics: that the thermal efficiency of the new engine is improved by more than 40% over its predecessor and that the new hybrid system targets an 18% improvement in fuel efficiency. Since the previous (non plug-in) Prius offered 89g/km CO2 and 72.4mpg combined, that works out at 73g/km and 85.4mpg, but this is to be confirmed.